This acai bowl made at home! The last week of February we had a huge snowfall in the capital region. This snowfall surpassed a record set in 1967, as I understand. The snow was so slick, wet and heavy, which resulted in many accidents. Cars got stuck within minutes of parking to pick up students in the school parking lot. Whilst I waited, I observed a few high school students going to several cars to push them out of the snow. The snow showed no mercy, falling as though making the point you can’t mess with Mother Nature and we should all have stayed in bed. Hopefully, this will mark the last we’ll experience a winter storm of this magnitude, being only three weeks until spring. As I Waited, I found myself daydreaming of warmer and calmer times. Specifically, our Christmas Hawaiian trip, which was just a couple of months earlier. 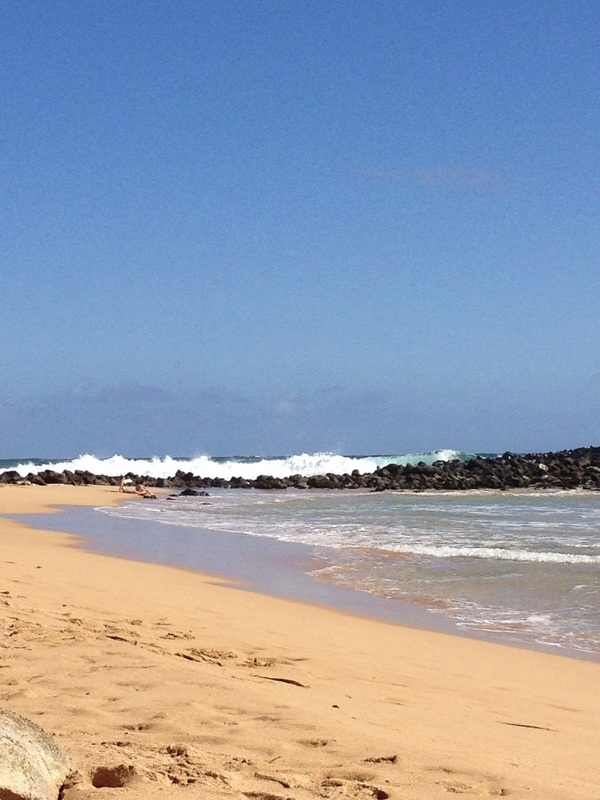 Sweet memories, of sun, sand, and the sound of the ocean surf came flooding to mind. I love the feel of the heated sand under my toes, and then to have a delicious cold something, something, to eat. 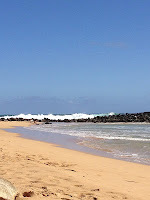 Which got me to thinking about a favorite pastime in Kauai, Hawaii. 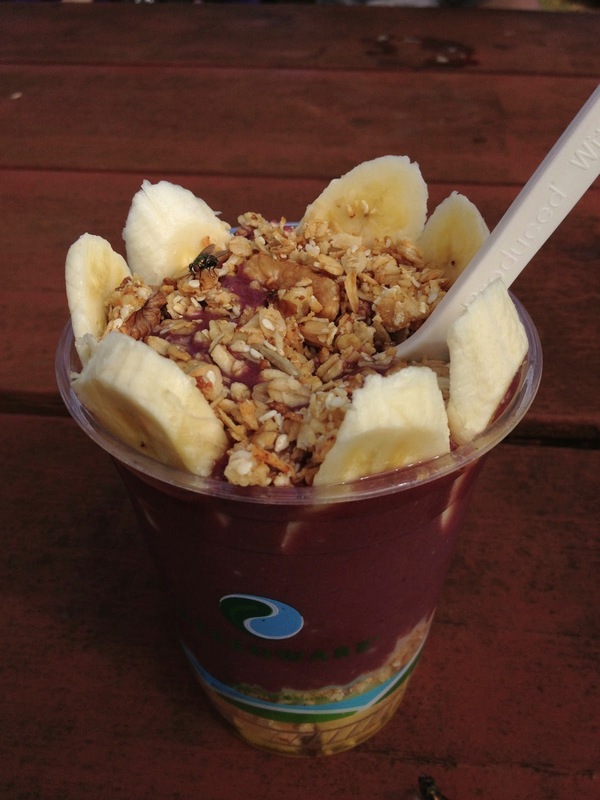 Taste testing acai bowls from different establishments on the island. What is an acai (Ah-sigh-ee) bowl? It is a bowl of sunshine, truth be told! The purple super fruit is from Brazil. If you are not familiar with acai’ bowl, it is a dish that for the most part is consumed for breakfast. But it can be enjoyed any time of the day or evening. The ingredients are granola, a fruit blend smoothie, which includes acai, and toped, with some fresh fruit slices, placed in a nice big bowl. There are no rules, leaving creations limited only by the imagination of the individual. However, it is my opinion that taste is enhanced knowing about the nutrient benefits especially if all ingredients are organic. Certainly knowing that the acai bowl, which is filled with antioxidants, omega-3s and amino acids all things that are good for you, makes this wonderfully enjoyable amazon treat quilt free. I'm telling you, when you experience that first bite, crunchy with a burst of cold and creamy sweetness, this can absolutely enhance your happiness and contentment level. It will make your day! This fruit stand is visually so appealing with bright colors of fresh fruit. 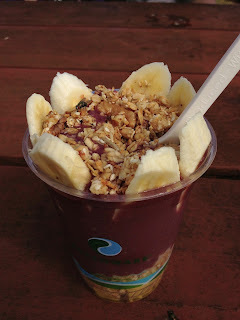 The acai bowls are a nice size, with a large serving of granola, fruit and acai. I enjoyed it and would have been my favorite. However, when told that there was a strawberry allergic person in our group, and then to be served a bowl with obvious bits of strawberry mixed with the other fruit. Not cool. Not cool at all! This place beside the highway is by far an island favorite! The generous plate serving size is not match by anyone on the island. The food is fresh, attractively plated and so tasty good. And the cold coconut milk is thirst quenching on a hot day. My acai bowl, however, was more on skimpy side, hardly no granola. 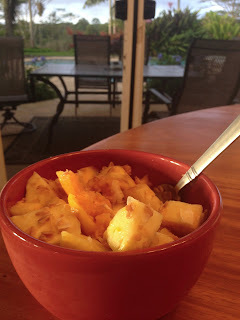 I personally love the crunch of the granola and I like more than one type of fruit as topping. So I asked for papaya for an additional fee. We almost missed this place and must have driven by it many times in the previous ten days on the way to the beach. Set back on a corner lot, with lonely empty picnic tables in front. But the girls while on their bike ride earlier decided to stop there to enjoy a shave ice. 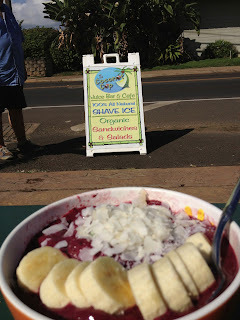 And wouldn’t you know it, the topping for the shave ice was natural organic fruit juiced. No sugar added!!! Wow. If they put that much effort into a shave ice what would they do with an acai bowl, I wondered. They didn’t disappoint. As it turn out this quickly became my favorite place on the island to enjoy an acai bowl. Unfortunately, we discover it on our last day. The bowl was a healthy size. Lots of granola, a combination of three different fruits, and the acai smoothie was so thick and absolutely delicious. Yummy. It is not only a healthy meal, but it is appealing visually too. After all, they say we eat with our eyes first. Yeah, that's what they say. Oh, speaking of visually yummy, I had an awesome kale salad at Rainbow Living Foods, in Kapa'a. Also on my last day in Kapa'a. On a snowy, stormy, wintery, February afternoon watching cars being pushed out of the snow, is one time living in the past, totally worth it.